Welcome to Beckett Case Break Auctions, a service by Beckett Auction Services. We are proud to offer case break auctions in a unique auction format by team, and we look forward to seeing you enjoy this new service! Thank you for checking out our Beckett Case Break Auctions. We are currently taking a break from the case breaks. We'll let you know when we're back on the air! You are not guaranteed to win any cards during any given case break. We do guarantee you will receive all cards from the team you purchase at auction (as listed in the auction title), with any exceptions or special circumstances noted below. We do guarantee you will receive at minimum a Beckett prize or promo pack. A standard shipping charge will be added to each winning lot. Should you not receive any cards in the case break, you will receive a random Beckett prize or promo pack from Beckett Auction Services. All case break lots purchased via auction must be paid for before case break happens or you forfeit the rights to your team lot. Any team not paid for will then be re-sold to the under-bidder or ownership assumed by Beckett Auction Services. A card will be noted as belonging to whatever team is listed as the team name on the card and not based on the jersey being worn by the player on the card. If no team name is noted on the card, then the team on the jersey the player is pictured in will be used. Cards that feature players in Olympic jerseys, college jerseys, minor leagues jerseys, All-Star jerseys, etc. will be noted as belonging to the player�s current team or most tenured team if not an active player. In the case of a high dollar card being pulled in the break, you may request (and pay for separately) additional insurance. Professional grading from Beckett Grading Services is available for an additional fee. Appraisals from Beckett Certified Appraisals are available for an additional fee. Redemptions that do not feature a player will be distributed by random.org or other random method. If redemption features only a player�s name, then it will be noted as belonging to the player�s current team or most tenured team if not an active player. Individual cards may be referred to Beckett Auctions to be included in a future online auction at a reduced seller�s premium of just 10%. 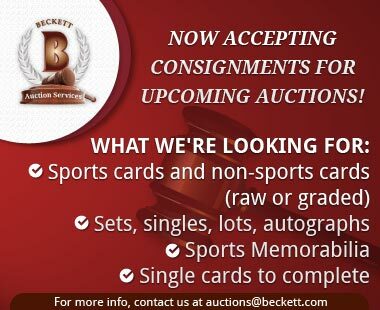 Please contact us at auctions@beckett.com for more information and to begin the process.